There is a common assumption that value makes a difference in sales and business results. As part of our Top-Performing Sales Organization research, we wanted to test that assumption and see just what kind of difference it makes. 16% of respondents agreed with all 5. We compared this group, which we labeled Value-Driving Sales Organizations, with the remaining 84% who did not meet these criteria. Priorities: We studied both leadership's prioritization of improving sales force effectiveness, and leadership's ability to execute on priorities. 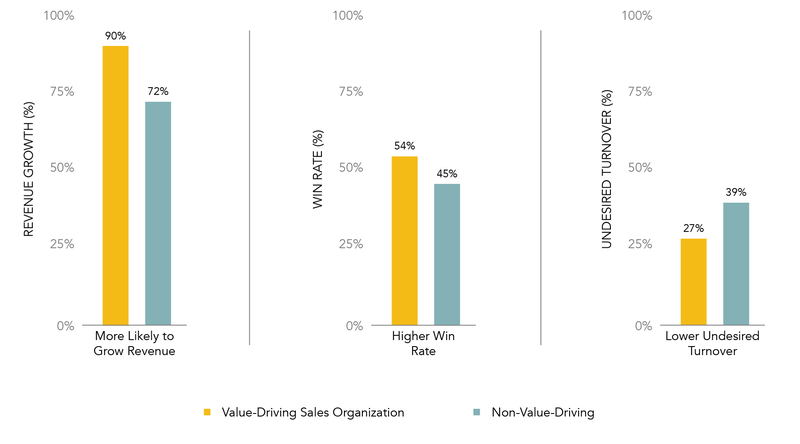 Both correlate significantly to top sales performance, with the Value-Driving Sales Organizations scoring much higher than Non-Value-Driving ones. 88% of company leaders in Value-Driving Organizations prioritize improving sales force effectiveness, where only 54% of Non-Value-Driving Organizations claimed to do so. Additionally, we asked company leaders "When you set a priority, does the priority get done?" 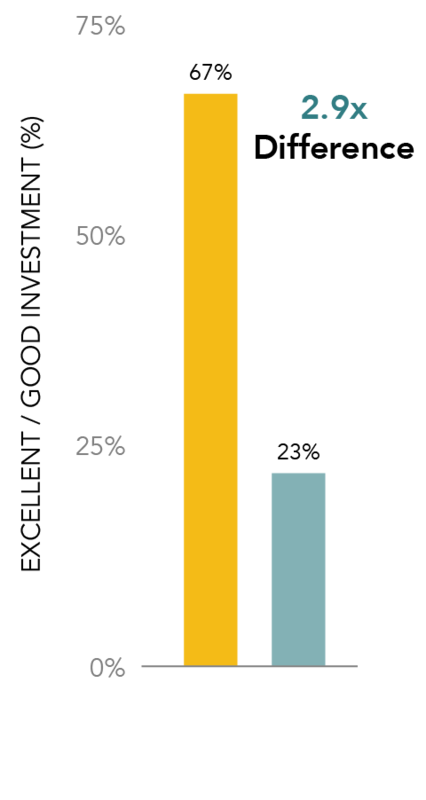 85% of leaders in Value-Driving Organizations answered yes, whereas only 49% of company leaders responded with a yes in Non-Value-Driving Sales Organizations. It's no surprise: the rigor and investment leadership allocates to sales performance makes a difference. Process Orientation: In our experience, without a unifying framework for sales processes, sales methods, and strategic account processes, sellers are left to their own devices. When left to their own devices, some sellers focus on value, and others don't (not necessarily for dubious reasons, often they don't know how). Of its nature, when this happens, average results are the norm. When asked, 100% of leaders in Value-Driving Sales Organizations answered that their sales process is customer-focused and maps to their buyers' buying processes, while only 38% of those in Non-Value-Driving Sales Organizations claimed this was true about their process. Additionally, 100% of sales leaders in Value-Driving Sales Organizations stated that their sales process is flexible to apply to their buyers' various roles and situation, whereas only 45% of respondents in Non-Value-Driving Sales Organizations said this was true about their sales process. Focus and investment in sales training: Leaders at Value-Driving Sales Organizations don't just prioritize developing sellers to be as valuable as possible to buyers, they invest in it. And when sales leaders prioritized training, there was a significant rise in sales skills, across the board. Better sales skills: Across every skill area, Value-Driving Sales Organizations have significantly stronger sales skills—in some cases 3x stronger skills than Non-Value-Driving Sales Organizations. Given that we know they invest more heavily in their sales training and that their training is rated more effective, it's no wonder they have a higher win rate, revenue growth, and sales force retention. Highly motivated sales forces: Sellers will tell you, "If I believe in what I'm selling, I can sell so much more of it." When sellers work at an organization they believe prioritizes driving customer value, and when their leaders prioritize helping sellers to create said value, seller motivation is drastically higher. Certainly, sellers bring their own intrinsic motivation to their jobs. It's up to the organization, however, to tap into seller motivation at a high level and sustain it. Account and Lead Assignment: By definition, Value-Driving Sales Organizations align their sales force structure with the way customers prefer to buy from. This often means assigning leads and accounts not just based on territory, but based buyer industry, company size, and need. Indeed, Value-Driving Sales Organizations understand what their buyers are looking for and assign the people who are best suited to win and grow accounts. 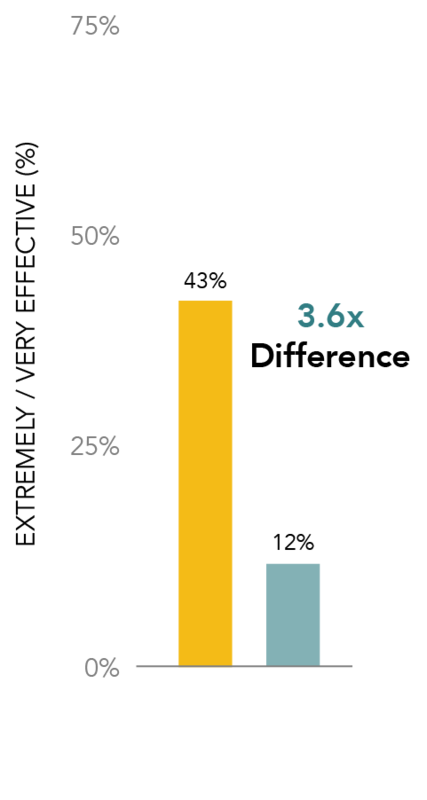 In fact, they are nearly 3x as likely as Non-Value-Drivers to be aligned with the way their customers prefer to buy. Pricing: By definition, Value-Driving Sales Organizations focus on driving maximum value for their customers (100% compared to 59% of Non-Value-Driving Sales Organizations). Value-Driving Sales Organizations are also 2x more likely to agree that their pricing strategy allows them to capture maximum prices in line with the value they provide. Our experience supports this. By focusing on customer value over price, companies are able to maximize prices and improve margins. Sales organizations that focus on creating and delivering value, aligning their structures and processes to do so, and investing in sellers' abilities to be more skilled, knowledgeable, and valuable get far better results. Make value a mission. It's worth it!